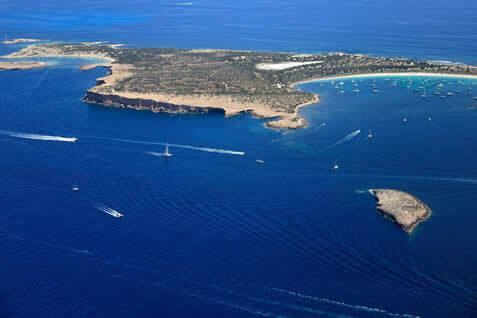 S’Espalmador, a small private island in the Balearic Islands, has been sold to a Luxembourg family for €18 million. Under the terms of the sale, the owners must observe state and regional law, which prohibits any type of construction on the nature reserve. The island had been on the market for months but the Balearic regional government and neighboring Formentera authorities say they were unable to purchase it because the asking price was too high and they had no financial support from the Spanish government. Up until now, S’Espalmador was owned by Norman and Rosy Cinnamond who inherited it years ago from their grandfather, Bernard Cinnamond, a Briton who bought it in 1932 for 42,500 pesetas (around €255 today) from the Ibizan Carlos Tur. The islet is nestled in the Ses Salines Natural Park and contains 137 hectares of land, stretching three kilometers long and just 800 meters wide. Given its position in the nature reserve, S’Espalmador is subject to tight controls that ban any construction from taking place. Indeed, all swimming excursions to the island have been stopped and the mud baths popular with tourists have also been banned. For months local authorities were talking to the former owners about stopping the sale and ensuring the land passed into public hands. In 2016, the Cinnamond family offered to sell the island to the Formentera municipality for €18 million in one payment, or €20 million in installments. Without sufficient funds, Formentera turned to the Balearic regional government for help and together they appealed to the Spanish government. “The owners told us they had an offer so we addressed the deputy prime minister of the central government to ask for support for the purchase. They verbally told us they would consider it but they never answered us and in the end the owners accepted the offer of the buyers,” explained councilor Pilar Costa. The Formentera municipality and the regional government were forced to withdraw their bid and the Cinnamonds put the property back on the market. Now, for the sum of €18 million, it will pass into the hands of a family from Luxembourg which is “well aware of the regulations of the island,” according to their representative. The representative said Costa stressed that S’Espalmador is under “total protection” and no change could be made to the natural environs. There are two small houses on the islet.